Some restaurants or caterers display the farms, some just show the region of origin. Overall the maps are not broken down to a specific menu item like some of the hardgoods and mass produced products we'll cover in the next article, they display the major sources of all ingredients used. Farm to table tacos. Enough said right?! Well maybe, but Cantina's map speaks a lot louder than those words as it shows their Ann Arbor Michigan customer base the location and farm names of their sources all over top of a birdseye view of a local farm. Classy! 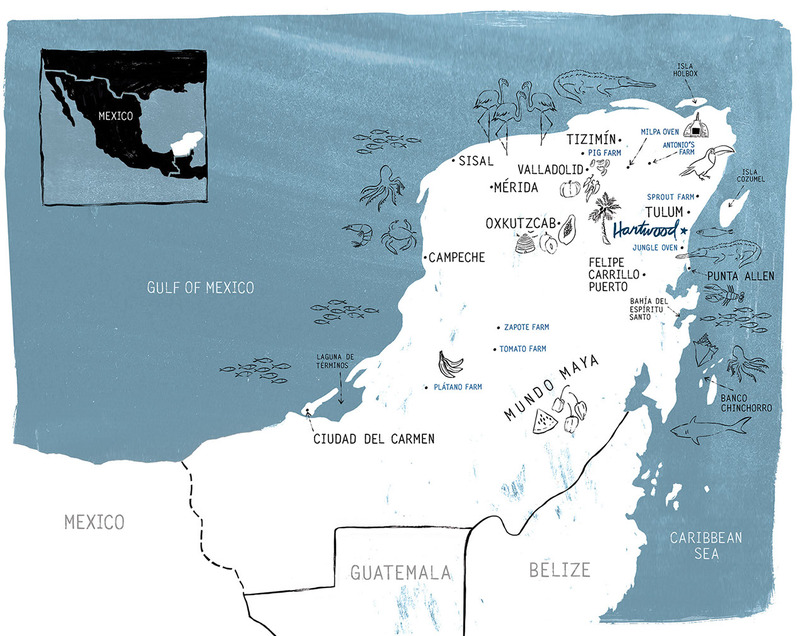 Cantina also is a great example of a map that shows the location, name of grower and product in a clear manner. At Bonobo wood fire pizza their goal is to support Maine businesses as well as make the best pizzas with the best ingredients, that’s why they choose to “buy local” and show it. 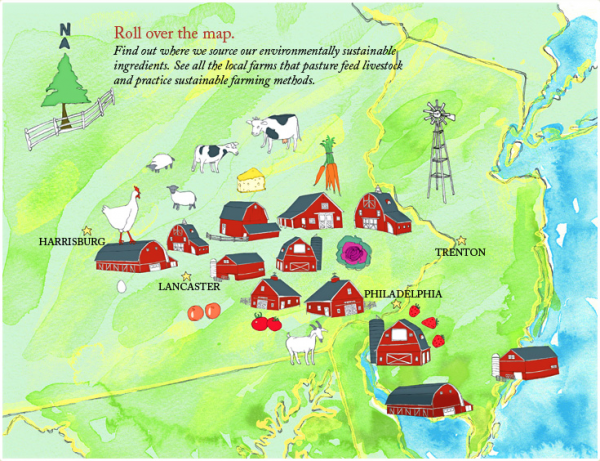 The map below illustrates all the farms they source their “top notch ingredients, such as tomatoes, chicken, goat cheese, and pork”. 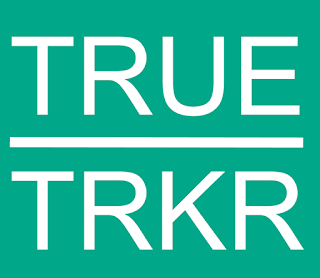 On their website, they even link to all of their sources to further promote their ingredients. 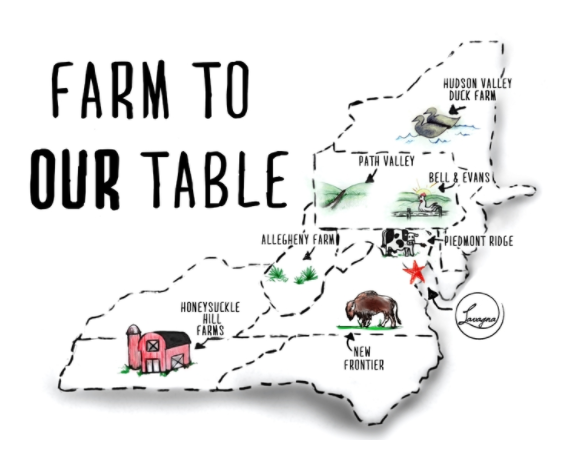 With a shout out to classic cartography, this antique looking map from Union72's Purveyors page is an interactive index of farms and ingredient sources. As a mid to high-end restaurant on Ossington in Toronto (I've been there twice! ), their map is as sophisticated as their restaurant design. Very nice!! 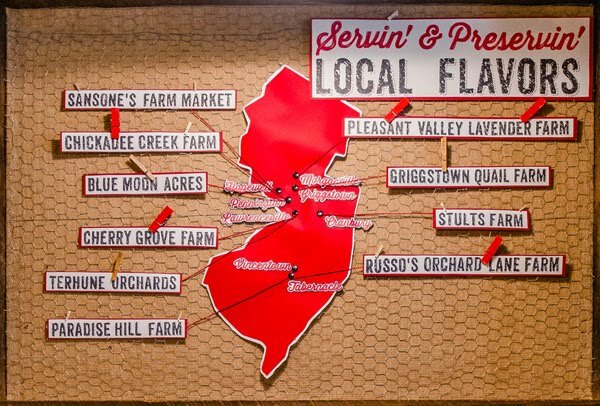 Jammin Crepe in Princeton NJ shows their support for local vendors by naming them on a map that is posted in their restaurant. 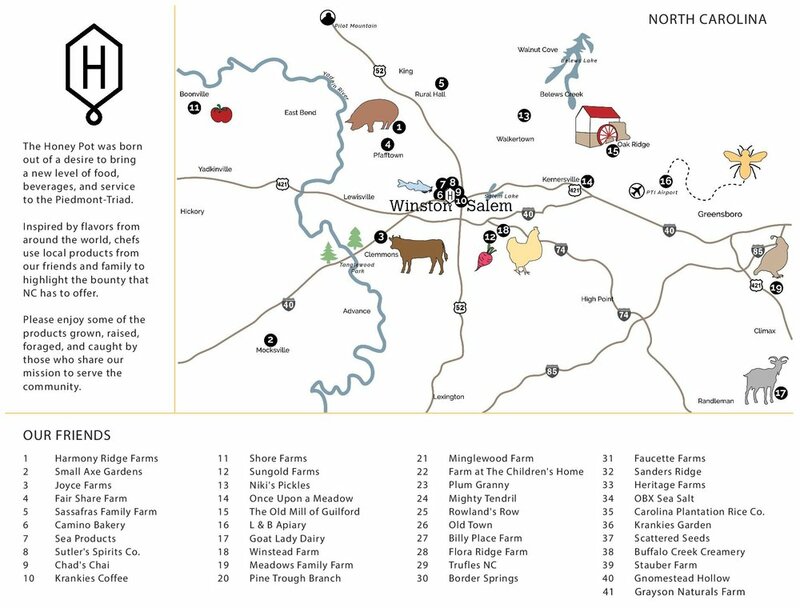 In addition, the map is posted with links to each vendor's websites, photos of the farmers and a brief description of their main products. A very personalized and effective messaging strategy. "Since 1983, White Dog has been committed to purchasing environmentally sustainable ingredients from local farms within 50 miles of our restaurants. Below is a list of those farmers, brewers, and artisans who we support and have helped grow over the years. ** White Dog was the first restaurant vendor to purchase from them." The vendor list is not tied to their map, however, even though the text says to "roll over the map", this feature does not actually work, which doesn't seem to hurt the effectiveness of the map in any way. 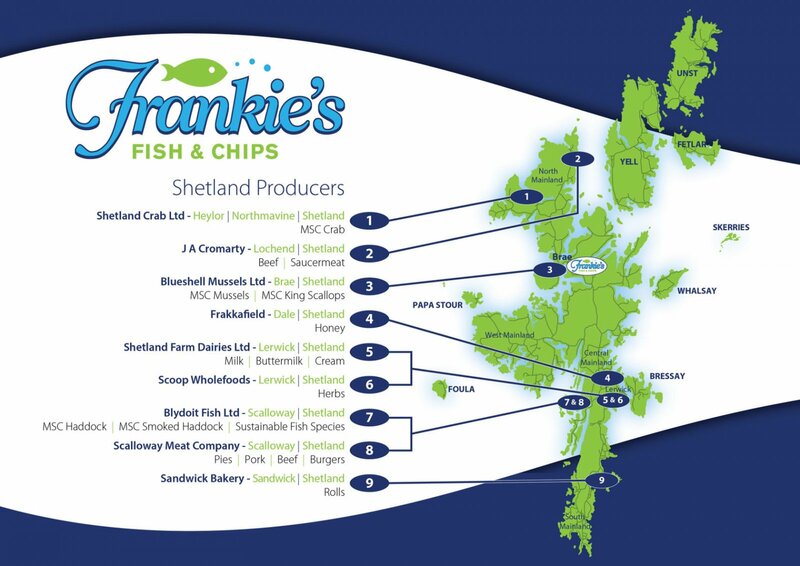 Frankie's Fish and Chips of Shetland aims to source their fish products from sustainable local stocks and other ingredients locally as well. This is an excellently put together map that fits well on their site. 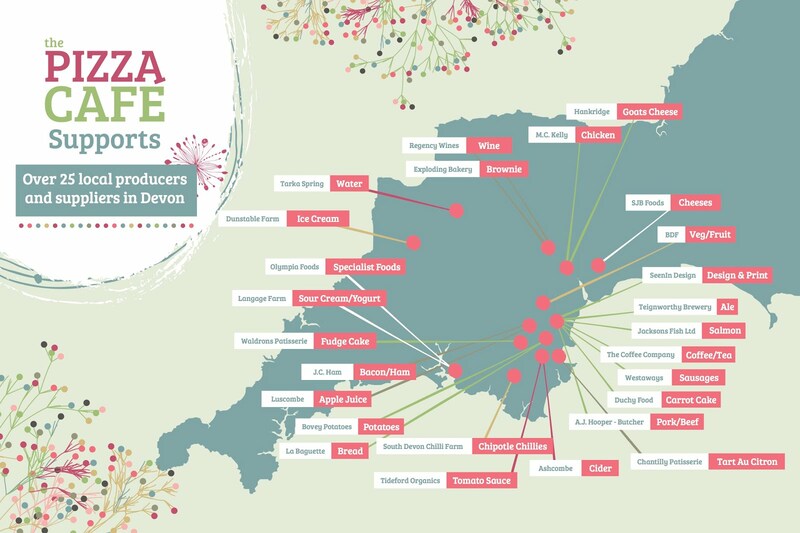 The Pizza Cafe in Devon UK uses an attractive graphic to show the location, ingredient, and provider in a quick and easy to decipher map on their supplier's page. 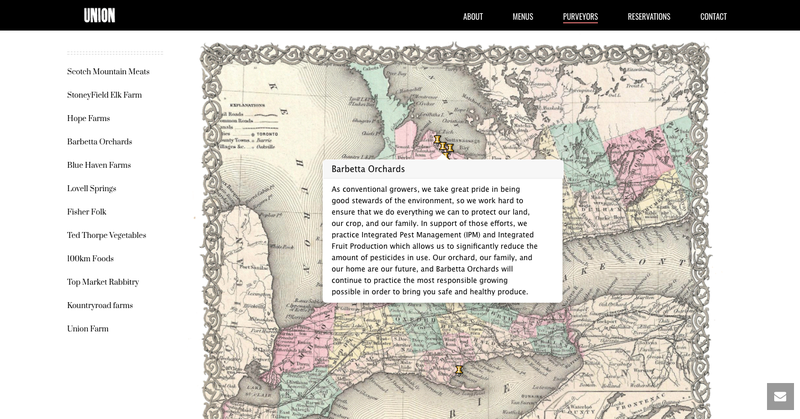 Although Honeypot no longer has this map up on their site, it is another great example of using an image associated with the food product and placing it in the location of the grower. Also, numbering and indexing the local growers further specifies the source. Hartwood's menu changes daily based on what the "sea and land offers as harvest each day". They provide a map of their major sources with farm names and locations. Most of the restaurants with a map showing food sources on their sites have something interesting in common - no mention of the actual map. In fact, it's only because of the image file names that I was even able to find them. At Lavagna it was no different. The below statement is all they mentioned about their sourcing. "Lavagna relies on a network of trusted local farmers for the ingredients that form the basis of our simple, contemporary Italian dishes. Our ever-changing menu reflects the best that the season has to offer." Hospitals are not usually known for their local sourcing, let alone their fresh quality, until now that is! In Guelph Ontario, St Joseph's Hospital maps the sources of food on their menu including their local sources and even the origin of their coffee. They even go so far as to list how many are processed within 100 Miles, in-province and internationally. Nice touch. Boston University knows that "You care where your food comes from and so does BU Dining". I really like this map as an educational piece. Not only do they get into "Why Local" but also "What Makes Food Local", a great icon key of ingredients and a direct link to learn more. School Meals at Beaconhill Community Primary School in Northumberland UK uses a regional, and inset UK map, to display ingredients served at school including milk, bread, beef, chicken and even the water. Top notch effort by this primary school! Lancer Hospitality is a multi-location caterer that is committed to sourcing locally. "Eating locally grown and produced food not only reduces the consumption of fossil fuels in the transport of food products over long distances but also often eliminates wasteful packaging materials. This will also help us reduce the use of pre-packaged, processed food items on our menu. This is significant because when we cut down on the use of processed foods we give our customers a fresher, healthier product." In the end, the restaurant wants to communicate their sourcing to provide patrons with a sense of freshness, safety, and responsibility. This is most commonly and accurately done by having a placemark on a map of the source. Declaring the name of the source. Explaining the products from that source. And, in some case, providing a small icon or image of the food.